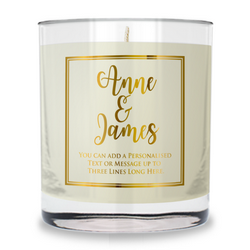 All of our quality designer candles for weddings can be personalised with the names of the bride and groom and the wedding date. 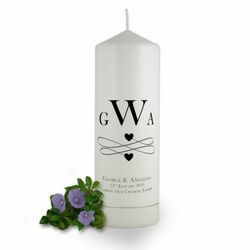 Create a wonderful personalised wedding gift keepsake today and give the loving couple the endearing memory that is a personalised wedding candle to remember their special day. 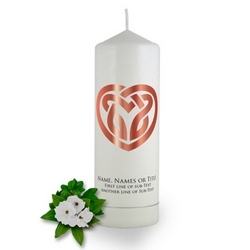 Ideal for wedding table decorations, wedding centrepieces or personal wedding gifts for Mother of the Bride and Groom and bridesmaids as cherished mementos for all to remember that special day. 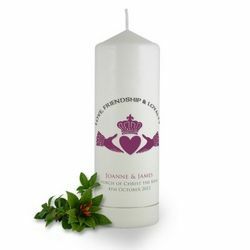 We also have an extensive range of candle favors which can be matched to the main pillar candle or given as favours to your guests, friends and family. 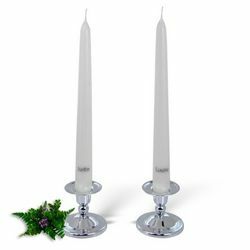 Alternatively they can be used as part of table decorations in conjunction with floral displays. Brinley Williams's personalised candles designed specifically for that magical day of marriage help ensure that your special day is the one day of your life that should give you that unforgettable sparkle; it requires a lot of sophistication and finesse that is rarely experienced in everyday life. 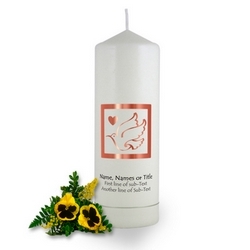 We have the perfect set of printed candles to go with this very important day . 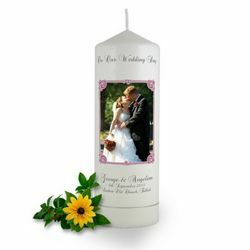 Add elegance and ambiance to your wedding with candles that carry luminous grandeur while also offering a memorable gift for your guests. The candles can also be used to decorate buffet tables for a candlelit dinner, create a lighted walk way or produce a soft and gentle glow at the reception. This will make it a day full of unforgettable ‘light’ moments with all your loved ones. Brinley Williams wants to help you create memories that will last a lifetime. 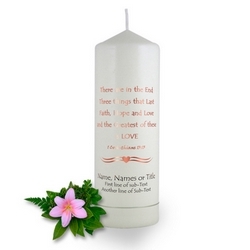 As such our candles include the name of the bride and groom and the date of the wedding. You’ll be absolutely over the moon with the kind of glow and celebratory feel that our wedding candles give. 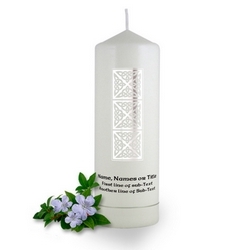 They are so beautiful, fantastically made and very quick and easy to light. 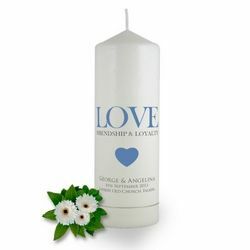 For an established brilliance on your special day, they can be lit on your wedding day and re-lit on each wedding anniversary. 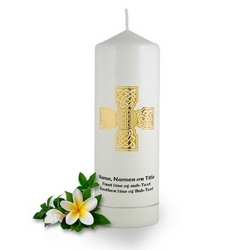 For special wedding themes, our candles can easy be incorporated to accommodate all your requirements. They are that unique something you’ve been looking for to compliment a perfect your day and we have a range of candles to fit every pocket. Our largest candle is a 21x8cm pillar followed by the slightly smaller 21x7cm both of which are available in either ivory or white. 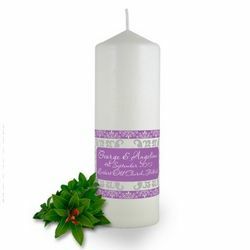 Next comes our smaller favour candles which are 13x7cms and make great gifts for guests and can double up as part of the table decoration prior to be taken home. If you would like to use candles of part of the marriage ceremony then our taper candles can be personalised with the bride and grooms name on separate tapers and then lit as part of the occasion. Finally if you have an idea for a candle which we haven't thought of then please do get in touch with us using our contact us page and we will be happy to help make your special day even more perfect. Your wedding day is the one day of your life that should give you that unforgettable sparkle; it requires a lot of sophistication and finesse that is rarely experienced in everyday life. We have the perfect set of candles to go with this very important day our wedding day candles. Add elegance and ambience to your wedding with candles that carry a lot of meaning to offer a memorable gift for your guests. The candles can also be used to decorate buffet tables for a candlelit dinner, create a lighted walk way or produce a soft and gentle glow at the reception. This will make it a day full of unforgettable ‘light’ moments with all your loved ones. Brinley Williams wants to help you create memories that will last a lifetime. 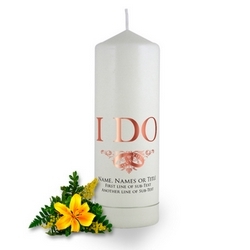 Our wedding range of personalised candles include the name of the bride and groom and the date of the wedding. 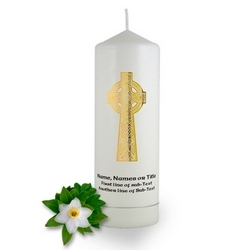 You’ll be absolutely over the moon with the kind of glow that our candles designs give. They are so beautiful, fantastically made and very quick and easy to light. They are that unique something you’ve been looking for to perfectly compliment your day.